En escabeche is a traditional method of preserving foods that was frequently used before refrigeration. 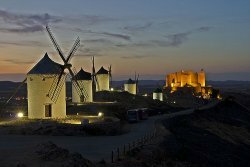 Castilla– La Mancha is known for its superb escabeches, of which this is just one good example. The mussels will keep in the refrigerator for up to a week. Discard any mussels that fail to close to the touch. 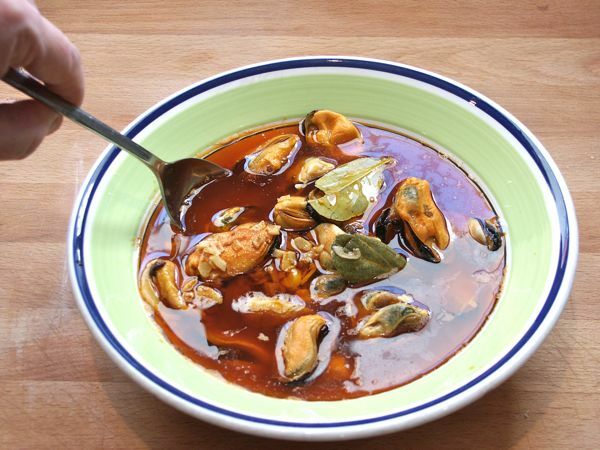 In a stockpot, combine the mussels with water to cover and add the wine. Bring to a boil, decrease the heat to low, and cook, shaking the pot occasionally so that the mussels shift about, for about 10 minutes, or until the mussels open. Drain the mussels into a colander or large sieve. Discard any mussels that have not opened. Let cool. Remove the mussels from their shells and discard the shells and any remaining beards. Set the mussels aside. In a nonreactive deep sauté pan or wide saucepan, heat the olive oil over medium heat. Add the onions, garlic, bay leaves, and peppercorns and cook, stirring occasionally, for about 10 minutes, or until the onion is soft. Using a slotted spoon, discard the garlic. Add the pimentón, salt, and vinegar to the pan. Be careful, as the vinegar may make the oil spatter. Mix well and decrease the heat to low. Add the mussels, mixing well, and simmer for about 5 minutes. Remove from the heat and allow the mussels to cool in the brine. Transfer to a bowl, cover, and refrigerate until cold. Serve the mussels cold with toothpicks for spearing or on decorative spoons.